We have two fast days coming up and fast days can play havoc on healthy regimens. Before the fast we have the urge to eat a lot forever afraid that we might starve. Not eating all day can cause us to eat too much and too fast when the fast is over. The Three-Bean salad below is great to have before the fast since it is light and filling. One can add a bit more chickpeas or other complex carb, protein rich beans. Teamed up with a protein and some whole wheat bread, this salad will help keep you going before the fast and serve you well after the fast. Beverages should be refreshing, easy, light and yet filling. These choices will prove how easy it is to serve lovely, filling beverages that are healthy and enjoyable. Teas are great to have before a fast and shakes are a perfect first course immediately following a fast—they are very filling and will help curb that first initial urge to eat anything and everything that comes to mind. Remember to drink lots of fluid before the fast and immediately after. If it is very hot on the fast day, it would be best to try to stay indoors and not over exert yourself. This is in order to avoid dehydration which can be serious. Use a strong blender that can easily chop up ice cubes. Process all the ingredients until smooth. Pour into nice glasses and serve. Mix tea bags, mint and sugar substitute in hot water, and let steep for 15 minutes. Remove the tea bags and leaves. Chill. When ready to serve add lime juice and stir. Serve in tall nice glasses over ice and garnish with additional mint leaves. Fresh herbs can be rinsed, wrapped in paper towels and refrigerated and/or frozen in a zip-lock bag. This lovely classic Three-Bean Salad can be made with any combination of beans. For those who are restricting carbs, use only 1/4 cup each of the kidney beans and chickpeas (starchy beans), or none at all. The taste is the same and just as satisfying – even for your guests. Open all the cans and discard the liquid. Rinse kidney beans and chickpeas in their open cans under cold water and drain. Put all beans into an airtight container and shake to mix. Add the remaining ingredients. Mix dressing with a whisk and pour over salad. Toss and refrigerate. It is best to prepare this salad a day in advance. When ready to serve, transfer to a glass bowl and toss ingredients. We at JDA are very happy to be part of the Jewish Magazine group and hope you enjoy the recipes! Please let us know what you would like to see. 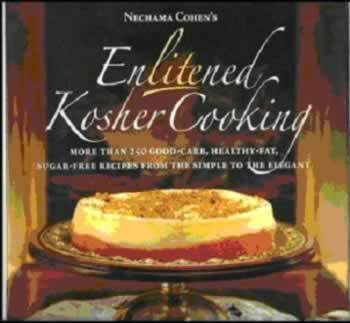 EnLITEned Kosher Cooking: www.jewishdiabetes.org and www.enlitenedkoshercooking.com Our web site is not just about diabetes—it’s about being and staying healthy!